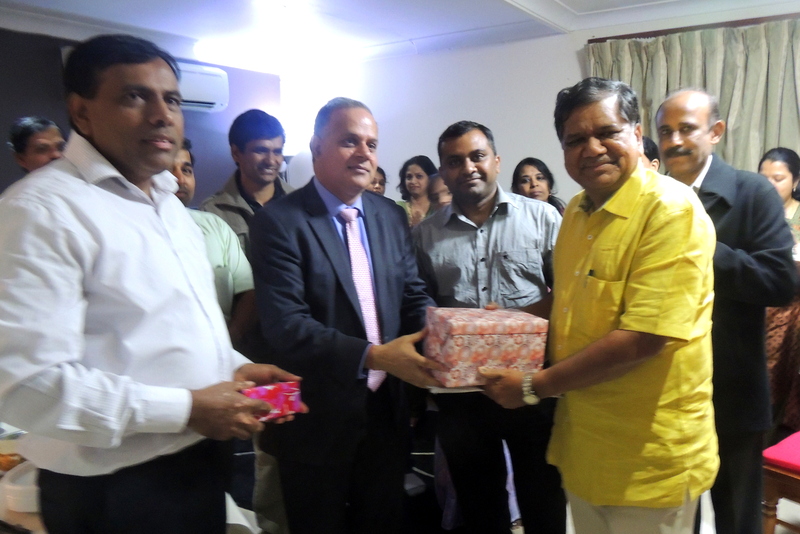 Sydney Indians met and interacted with Former Karnataka Chief Minister, Mr Jagadish Shettar! 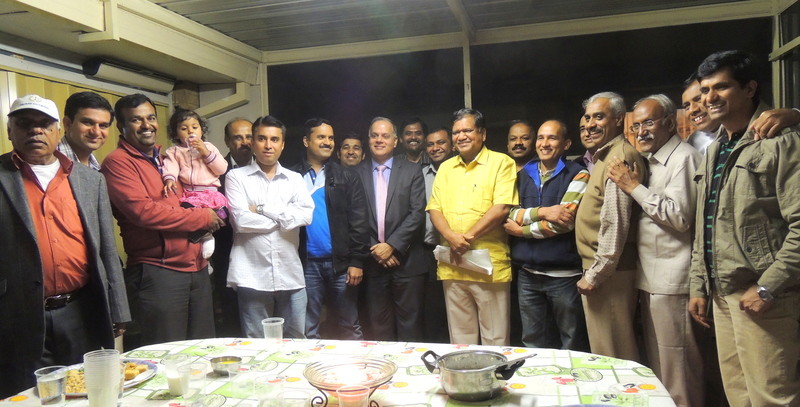 On Wednesday, 30th April, 2014, members of Sydney’s Indian community, particularly from Karnataka, met and interacted with Former Chief Minister of Karnataka, The Hon Jagadish Shettar, at the home of Hemanth Raju in Glenfield, NSW. Hemanth is the current President of Basava Samithi, Sydney. Approx 50 people were present. Prominent among them were Hemanth Raju, Paramesh Halaradhya, Satish Bhadranna, Mallikarjun Ramanahalli and Chidananda Puttarevanna. Mr Shettar was in Australia to take part in “6th International Sharana Samskriti Sammelana” meeting in Perth recently. He visited Sydney after this meeting, before travelling to Melbourne and NZ. He has a vast record of public service in Karnataka. He was a lawyer by profession, before entering Karnataka Assembly in 1994. His family members and he has been long term Jan Sangh/BJP members/supporters. He was an active leader of Akhil Bhartiya Vidyarthi Parishad (ABVP) during his student days. He has also held the position of Karnataka BJP President at one stage. He served as Speaker of the Assembly in 2008-9, Minister in various Karnataka Govts at various times, and was the Chief Minister from 2012 to 2013. Currently, he is the Leader of Opposition in the assembly. He is a senior leader of BJP, with a lot of influence, following and support in Karnataka. Our interaction with him included topics of Indian Governance, Karnataka Politics and Indian election. He felt that a minimum of 20 MPs from Karnataka will be from BJP. He was confident that NDA (National Democratic Alliance) will form the next Govt at the centre and Mr Narendra Modi will be the next Prime Minister of India. We enjoyed home-cooked and typical Kannada food, prepared by various members of the community. We were very impressed with his down to earth nature and simplicity. We enjoyed his sense of humour. It was indeed a great pleasure to meet Mr Jagadish Shettar! All nett proceeds from INDAUS Fair on Sunday, 11th Aug, 2013 going to Uttarakhand Flood Victims! Uttarakhand State in India has had catastrophic and massive floods on 14-17th June, 2013, leading to huge loss of lives, property and infrastructure. Many roads, bridges, villages and towns have been washed away. Rescue efforts were heroically performed by Indian Army, Indian Air Force, ITBF [Indo-Tibetan Border Force] along with civic authorities. Death toll stands at 5700. The devastation in the region is going to have a lingering and cascading effect on people for long time. This is all very sad, shocking and upsetting. Our hearts go out to the victims and their families. Indians, wherever they live, are doing what they can do to assist victims. Reconstruction in Uttarakhand needs as much help as possible. State Govt has requested Central Govt to provide a 13000 Crores reconstruction package to the devastated state. Indians all over the world, and in India, are doing their bits to help the state and affected people. Indians in Sydney are doing their bits too. I am sure we all will contribute in some way to the assistance work. 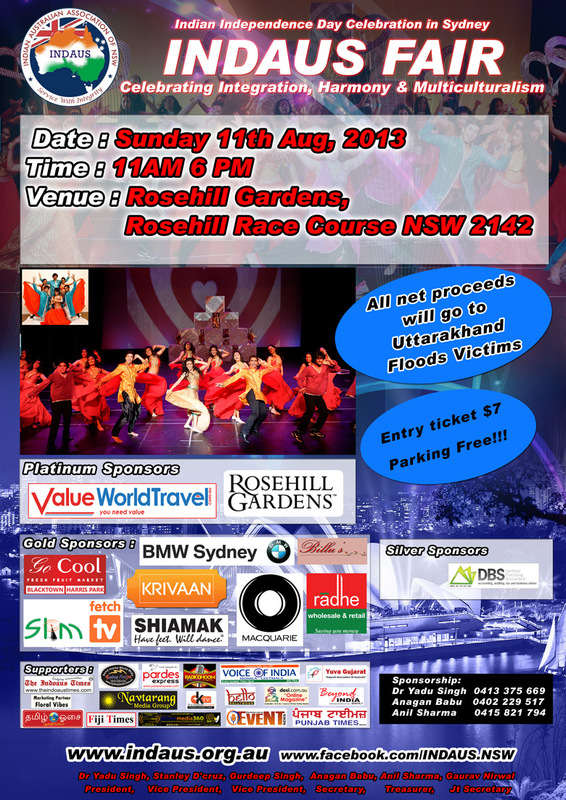 INDAUS Inc team have resolved to contribute to this assistance by donating all net proceeds from their flagship event “INDAUS Fair” at Rosehill Race Course, Rosehill, NSW 2142, on Sunday, 11th Aug, 2013 to Uttarakhand flood victims. INDAUS Inc had originally planned to send the net proceeds from INDAUS Fair to INDIA HOUSE project, but the tragedy in Uttarakhand is more pressing and is a more deserving cause. That is why we have decided to send net proceeds to Uttarakhand flood victims. We, in INDAUS Inc, urge you to join us for this event on Sunday, 11th Aug, 2013. The ticket price of $7/per person is next to nothing, and is easily affordable. We seek your help re getting as many stalls & souvenir Ads as possible! Let us spread the message in our networks and get there in big numbers! Victims need your help and generosity! Please show our generosity for Uttarakhand Food victims by joining, attending & supporting INDAUS Fair on Sunday, 11th Aug, 2013! 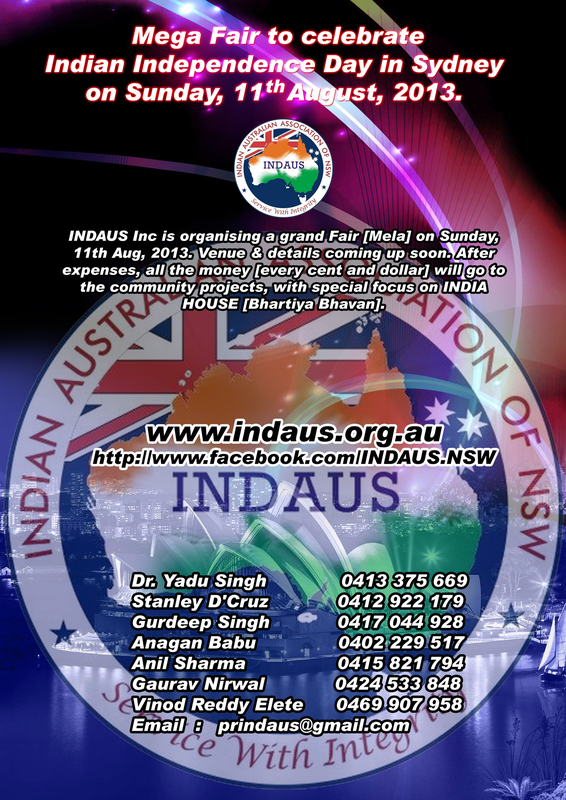 INDAUS Fair in Sydney: Sunday, 11th August, 2013. 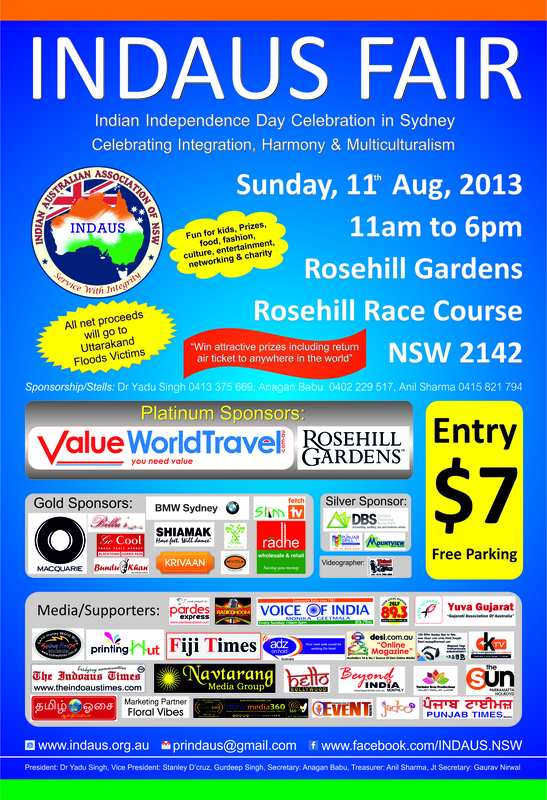 INDAUS Fair in Sydney: Sunday, 11th Aug, 2013. Venue info and other details coming up! 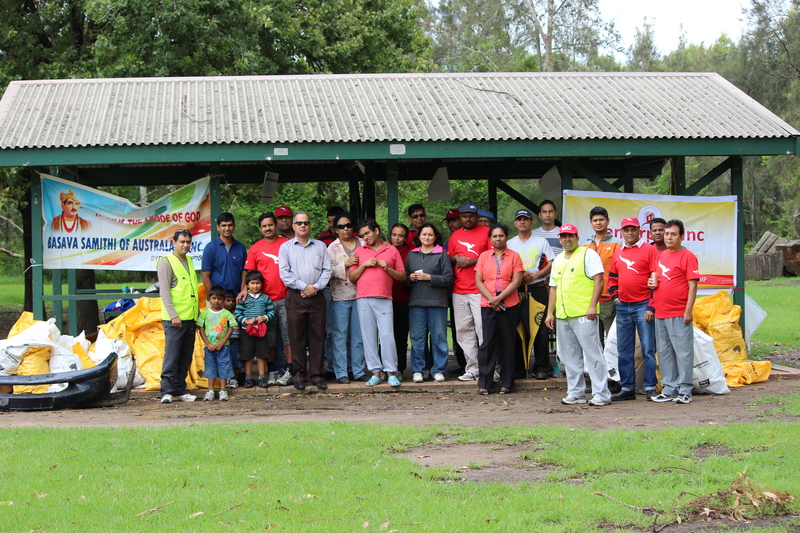 Indian Australian groups contributed to Clean Up Australia Day on Sunday, 3rd March, 2013! 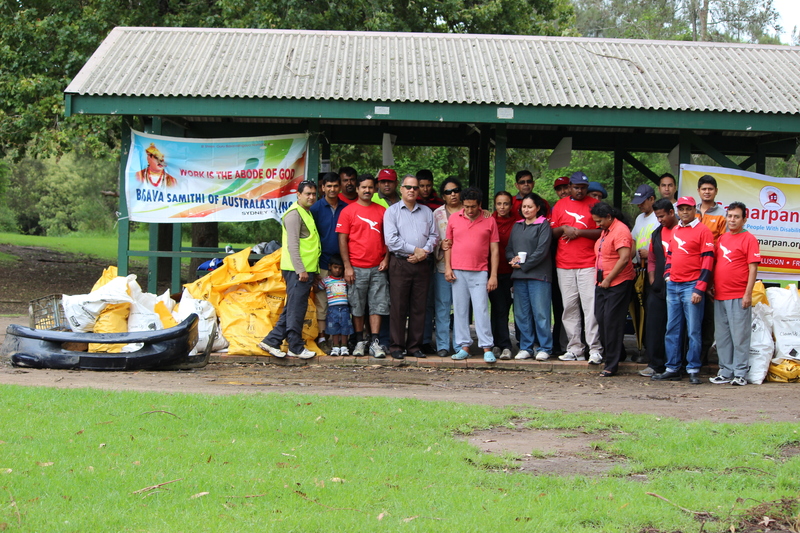 Like last year, we took part in Clean Up Australia Day activities this year too. 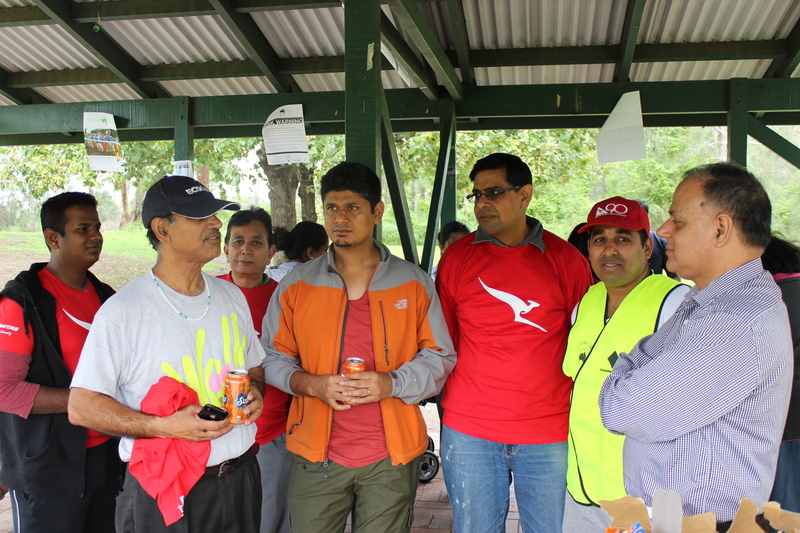 On Sunday, 3rd March, 2013, friends from 3 organisations-Indian Australian Association of NSW Inc [INDAUS Inc], Basava Samithi of Australia [BSOA]-Sydney Chapter and Samarpan Inc [A group of people who have family members with disabilities] joined up for the clean up activities at GARRISON POINT, MURRUMBEENA RESERVE, OFF HENRY LAWSON DRIVE, GEORGES HALL, NSW-2198. It started at 8 am and went on until 10.30 am. After collecting several bags of rubbish, the clean up party had a tea/coffee session and general discussion, followed by certificates and pics. We discussed how important it is for all of us from all sort of backgrounds to get involved in Australian events/activities which will help Australia and Australians. Australia is after all our home! People who took part in it included myself [Dr Yadu Singh], Chidanand Puttarevanna, Stanley D’Cruz, Gaurav Nirwal, Rajni Chandran, Uday Shah, Jaywanth Vaidya, Parul Shah, Hemanth Raju, Paramesh Halaradhya, Vishwas Suresh, Dayanand Mogale, Vishwanath Halyal, Prajwal Pradhan, Vijay Kumar and many others. “Australians have more than demonstrated their passion and responsibility for cleaning up their local environment. 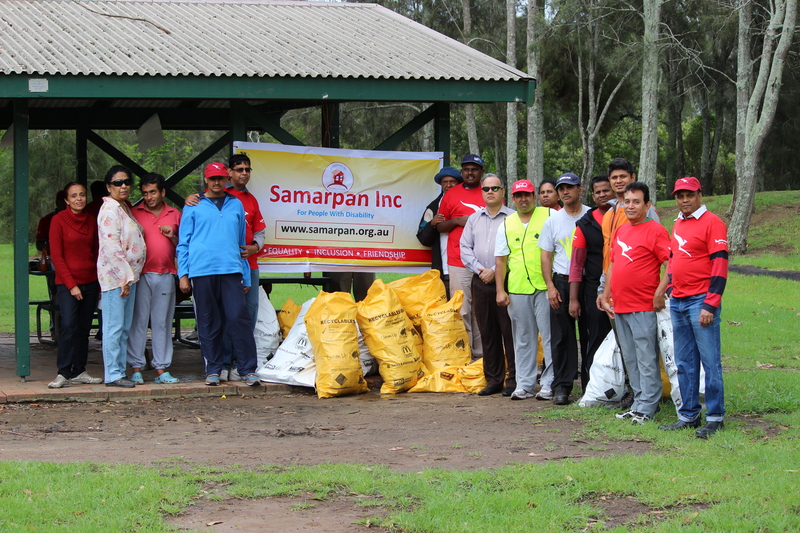 Over 550,300 volunteers have donned their gloves and picked up a bag to remove rubbish from around 7341 sites across the nation. Early figures predict they will have removed around 16,150 tonnes of rubbish, just the beginning of what is shaping up to be a tremendous effort yet again. Indian and other multicultural groups have been increasingly participating in these activities. Australia is a great & clean country and it is everyone’s job to keep it that way. We did our part and are proud of it. 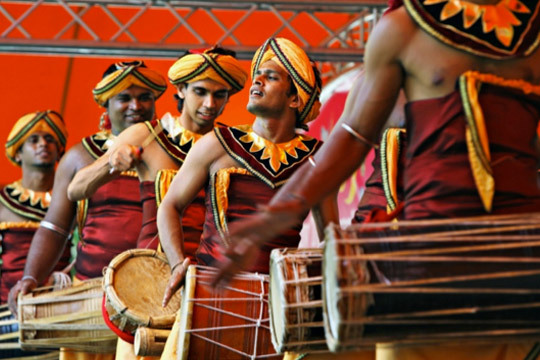 Parramasala, The Australian Festival of South Asian arts, is a milestone in multicultural NSW! Parramasala, the Australian Festival of South Asian Arts, was initiated by Premier Kristina Keneally, then Premier of NSW, in 2010. It was held in 2011 and 2012 too. I and my friends have enjoyed it every year. Thousands of people from all backgrounds have enjoyed it too. There are some question marks over whether it will continue in 2013 and beyond . 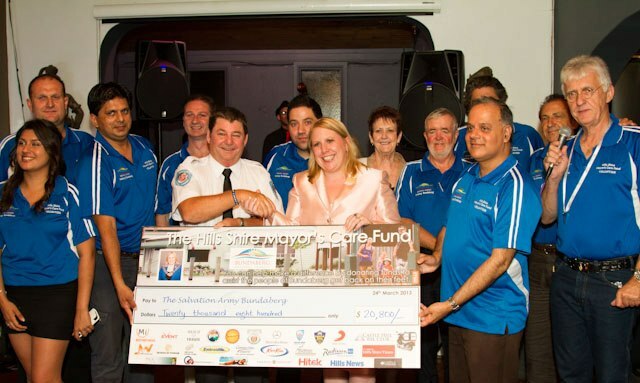 The budget of the festival is approx $1.5 millions, out of which approx $300,000 is contributed by Parramatta Council. I attended a meeting, called by Parramatta Mayor recently. There was a discussion regarding the direction Parramasala should be taking from now on. 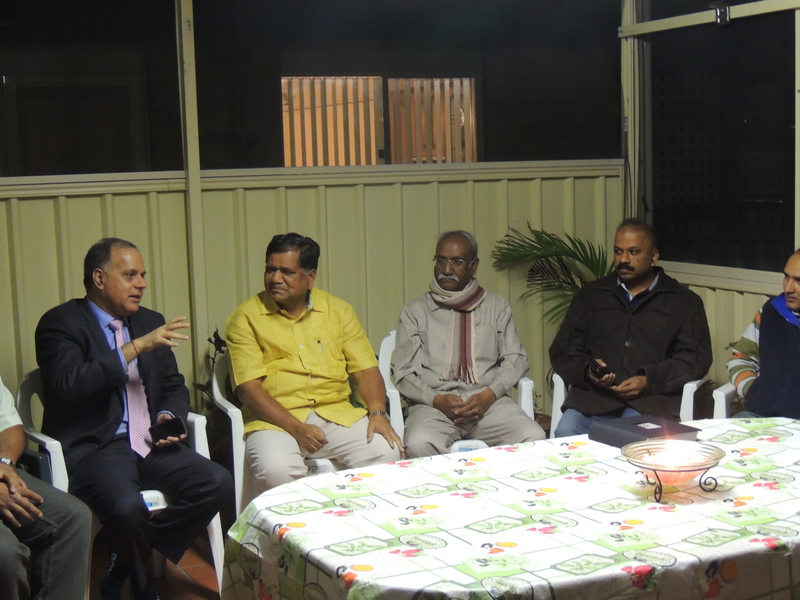 There was a discussion regarding whether one segment of Parramasala should happen in the neighbouring Harris Park suburb where there are many businesses from Indian/South Asian community. There was a discussion whether “Curry & Spice festival”, focused on Harris Park should be included in the Parramasala. There was a discussion regarding what Parramatta Council should do to get Harris Park included in Parramasala event. There was also a discussion regarding what Parramatta Council should do if Parramasala does not include Harris Park in the event. After this meeting, we, the members of the community and businesses from Harris Park, had some further discussions among ourselves. I had some further discussions with many people on this. 1. Parramasala is a significant event for NSW and South Asian communities. 2. 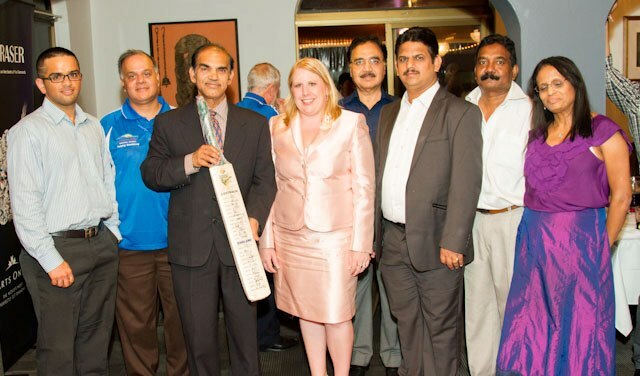 Parramasala should continue to happen in 2013 and beyond. 3. Parramatta Council should continue to be a partner in Parramasala, contribute its share of money and should have a significant role in organising the event. 4. It will be nice if Harris Park event-Curry & Spice festival- is a part of Parramasala. 5. Parramasala should still continue to be held, even if Harris Park event-Curry & Spice festival- is not a part of Parramasala. 6. If Harris Park event-Curry & Spice festival- is not a part of Parramasala, it should still be organised and it should happen separately. Money aspect for Harris Park event should be worked on separately and should not be mixed or confused with anything to do with Parramasala. Contribution in advertisement and other related costs should be based on some fair formula. Contribution share based on number of seats in the restaurants is one such formula. Non-food businesses need to be involved in the festival and their contribution will need to be reasonable and fair. 7. Harris Park event- Curry & Spice festival- should be organised with participation from local businesses, community reps and Parramatta Council, as it is not only about local businesses. Parramasala Board should have only those people who have vision, ability and capacity to organise an event of this nature. This is important to help this event grow , make the event more popular and have bigger participation of not only South Asian communities, but also general community. This has not happened and this needs to be reviewed why it has not happened. Nomination of people in Boards of events of this nature should be guided by quality and ability, in addition to vision of such people, not who the Govt leaders like even if such members do not have the required quality and ability.